A light-hearted fun read with plenty of humour. It was a different writing style from what I’m used to reading but still enjoyable once I got used to it. There are plenty of laugh out loud moments and it is a bit manic in places which added to the story. Plenty of characters woven in to the story and lots of side interests – ballet terms, for instance. The Scottish colloquialisms were used well and explained clearly for those of us south of the border! Love the drooling dog and Quill. 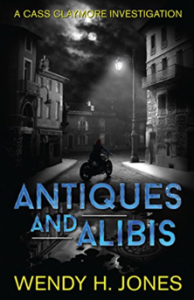 Well worth a read and always good to have a new style of cozy mystery. Cass Claymore could well become a household name in Dundee! This is the first book I have read in the series and I enjoyed getting to know Beth Haldane, single mum (widow). It made for a different kind of read setting the story in contemporary Dulwich with the closeted lifestyle of a village within a city. The story develops gradually as we are introduced to the characters who grace the pages. 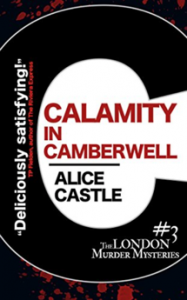 The author has an interesting writing style, more detail and eloquence that normally present in a cosy mystery. The humour is apparent throughout and definitely include some laugh out loud moments as the protagonist bumbles her way through life while trying to balance work, motherhood, an attempt at dating and a developing mystery. Beth, a widow is coming to terms with the possibility of a new romance and explores the online dating world in spite of being attracted to the hunky detective who rubs her up the wrong way. The book is a slow burner but a satisfying and enjoyable read. I would read another book by this author. Having picked this one up at the Derby Book Festival where the author was speaking, I have to say that I loved it, particularly as I like historical fiction and a good cosy murder mystery. There is plenty of content to keep you interested as the story progresses introducing different characters along the way. The setting in the early 1920s, I felt was well researched and the effects that the Great war had on ex soldiers and nurses who were subjected to at that time was true to life. I liked the mix of fact and fiction and how the author brought in the true horrific murder of a war nurse, Florence Nightingale Shore, a murder that took place on a train and one that was never solved. 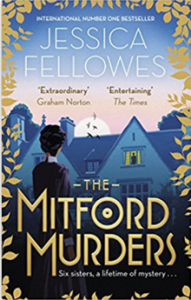 I confess, I knew nothing about the Mitford family, except the link to Chatsworth House of one of them, but am intrigued now to know more about them and the controversy surrounding the family. The story of this book centres mainly around the oldest Mitford sister, Nancy. I also enjoyed the insight into the upstairs, downstairs life of the family which is interesting and continues in the vein of Downton Abbey from that perspective. The main protagonist, Louisa was plausible and her background believable as that of a young woman brought up in poverty during the era. Her love interest, Guy is also a likeable character whose tenacity to solve the murder of the nurse is admirable. I liked the plot and the introduction of red herrings at various points throughout the book that kept one guessing. It wasn’t until nearer the end that I guessed whodunnit! I liked the writing style and the humour that was interspersed at various intervals. I would highly recommend it if you like a good, clean murder and if you are a fan of historical fiction. I look forward to reading the next book. I actually bought my copy at the Derby Book Festival where the author was speaking and I recommend the print copy as the gold embossing makes it a real treat of a hard copy. I will also be buying the book about Florence Nightingale Shore, the murder subject of this book written by Rosemary Cook to discover more about this nurse and her tragic end. This one had me hooked from the word go. Cece is an engaging middle-aged character who starts off as a downtrodden and somewhat pathetic woman but this all has to change when her husband walks out in the first few pages. When her husband leaves her with a mountain of bills, Cece has to find a job. This alone is a first for her as she is used to enjoying the high life associated with her husband’s position. 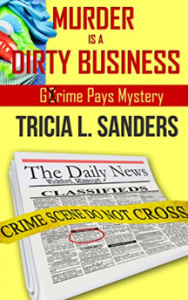 Cleaning up crime scenes wasn’t what she had in mind but the money is good and she needs it. A murder takes place and she is drawn into the investigation through the victim’s relationship with her daughter and her friends. Chaos surrounds her life and she has to fend of her controlling mother-in-law while dealing with unpaid bills, a stroppy daughter and an attractive detective. The book has everything that is needed in cozy – stroppy teenager, menopausal women, evil mother-in-law, hunky detective, friendship, humour and most of all – a good plot. You will not be disappointed if you read this one. I will definitely look out for the next in the series. Tricia writes with style and humour. If you love a cozy mystery then buy this book. This is the first book in a cozy mystery series by author, Debbie Young. I found the story of the young Sophie Sayers who inherits a cottage in a country village absorbing and entertaining. Sophie arrived nursing a semi-broken heart after discovering that the boyfriend she had been following around Europe was not going to chase her to England! There are some interesting village characters to get to know and each has their own charm. There is also the inevitable murder and the whodunnit aspects of the plot that unravel along the way. Is Sophie going to fall for another bad character or will this one turn out to be different. No plot spoilers here so you will have to read the book to find out. The book centres around an annual summer show in the village which everyone will turn out to watch. On this occasion though they get more than they bargained for as one of the participants is found dead on a Float! If you have ever wondered what it is like to live in an English country village, then this is the series for you. Not that there is a murderer in every village you understand!